This article first appeared in Personal Wealth, The Edge Malaysia Weekly, on September 24, 2018 - September 30, 2018. Southeast Asia has seen a significant increase in impact investments in recent years, according to the Global Impact Investing Network (GIIN). Private impact investors (PIIs) — fund managers, family offices, pension funds and other types of private capital — poured nearly US$1 billion into the region from 2007 to 2017 while development finance institutions (DFIs) deployed US$11.2 billion, it says in its “Landscape of Impact Investing in Southeast Asia” report, published in early August. “Southeast Asia has been the fastest growing impact investing market in the world for the past five years. The region offers dynamic business environments, with increasing entrepreneurial and investment activity focused on ensuring inclusive and sustainable economic development,” says GIIN director of research Abhilash Mudaliar in a media statement. Impact investments have been the most prolific in the financial services, energy and manufacturing sectors, capturing 82% of the total capital deployed (63% of total deals) from 2007 to 2017. Indonesia, the Philippines and Vietnam were the three largest markets in the region, having attracted 60% of the capital deployed. 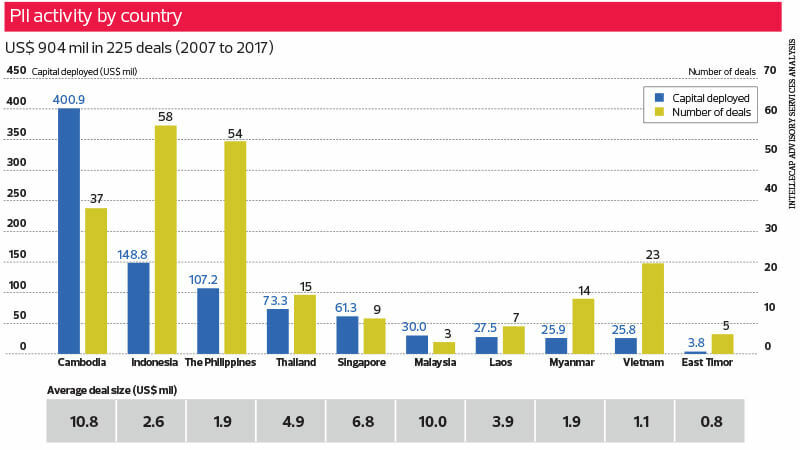 When it comes to impact investments made by PIIs, Cambodia, Indonesia and the Philippines lead the region in terms of investment amount and the number of deals. Of the three countries, Cambodia has received the most impact investment dollars by far. DFIs also invest in PIIs (typically impact fund managers) to drive impact investments in more targeted areas such as poverty alleviation, job creation and women’s empowerment. By investing through PIIs, DFIs are able to target smaller enterprises. “Given the size of the region and the fact that populations have limited access to basic services, investors see significant potential in expanding their impact investment themes over here,” says Mudaliar. Malaysia does not see many impact investments compared with the rest of the region as it is relatively more developed than many of the other countries, says Mudaliar. “That is why Indonesia, the Philippines, Vietnam and Myanmar tend to attract more impact investment dollars. However, the [impact investment] outlook for Malaysia is promising as there is growing interest,” he adds. Furthermore, incubators and accelerators such as Unltd Malaysia, Impact Hub Kuala Lumpur, IIX, the British Council’s Skills for Social Entrepreneurs programme and the Asian Venture Philanthropy Network are helping businesses become investment-ready, in addition to helping develop the impact investment ecosystem at large. That is not to say there are no opportunities in Southeast Asia’s more developed economies. Countries such as Singapore, Brunei and Malaysia have their own set of challenges, including high levels of greenhouse gas emissions, great reliance on foreign workers and rapidly ageing populations. Although distinct from traditional impact investment sectors in the emerging markets, these challenges offer huge potential to create positive social and environmental impact while generating financial returns. Once considered a novel asset class, impact investing is starting to make a financial case for itself. Impact investors are generally able to see positive returns, says Mudaliar. However, investors should manage their expectations. “Not all impact investors seek competitive returns as some markets are still too ‘frontier’. Here, concessionary returns — positive returns that fall below market returns — are more realistic,” he says. Mudaliar says Southeast Asia is seeing more impact investment dollars from the region itself. “Historically, most of the capital for impact investing in the region had originated from traditional investor capital bases such as North America or Western Europe. Another promising trend is the growing participation of local investors, led by wealthy families and high-net-worth individuals [in the region]. We expect this trend to continue rapidly across all investor segments in the coming years,” he adds. Even so, there is a major financing gap in seed-stage impact investment capital, says the report. Impact investment deals under US$500,000 are rare. Most of them exceed US$1 million. local presence would make impact investments much more effective. Although partnerships with local accelerators, incubators or financial advisers can help impact investors secure deals, those with a direct local presence tend to be more successful at sourcing and managing investments. In Indonesia, the Philippines and Vietnam, for instance, the average annual number of deals made by investors with a local presence is almost twice that of those without a local presence. Local fund managers also require capacity-building support to better adapt to the customs and nuances of the countries they operate in and more effectively assess deal pipelines. To address these, many investors based outside the region have started to employ local talent or form partnerships with local funds, especially in Indonesia, Vietnam and Myanmar. The report notes a lack of policy provisions in the region that encourage impact investments. In some countries, simply fostering a more business-friendly regulatory environment could indirectly stimulate the segment. For example, simplifying the registration process for new companies and making it easier to gain access to government support or finance are tides that would raise all ships, so to speak. Certain countries such as Thailand, Vietnam and Malaysia, are further ahead in their impact investment development. These countries have attempted to establish regulatory frameworks under which social entrepreneurs can register and receive tax incentives or government-led buyback agreements. However, some policies have been known to be counterproductive. The report cites a law in Vietnam that requires social enterprises to reinvest profits. This, the report contends, has discouraged many businesses from registering as social enterprises. Also, certain enterprises may be wary of being labelled “social enterprises” due to concerns that the market may perceive them as being less serious. Another challenge for impact investors in the region is the lack of clear exits. They have reported few exits from equity investments, which may reflect the limited transparency around exits, insufficient exit options and the nascent market’s limited track record. Disclosed records of exits in recent years are limited to a few countries such as Singapore, Thailand and Indonesia, says the report. However, as the awareness of responsible investing grows, many formerly impact-agnostic investors are putting their money in impact-focused funds or beginning to consider social and environmental impact as part of their investment philosophy.